If your considering an upgrade to triple star rated Ultion locks for your Upvc doors, then call JP Locksmiths. 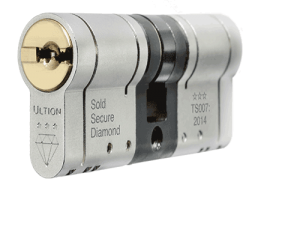 Brisant Ultion Locks are 3 star rated, Sold Secure approved, Secure By Design (police) approved, British Sandard Euro Cylinder Locks. Please watch this video, it tells you all you need to know. JP Locksmiths are an authorised Brisant Ultion Locks dealer, ready to supply and fit triple star rated Ultion Locks. We carry a stock of all sizes on our van, we are ready to Upgrade your locks, when you are. European profile (or Euro profile) is a type of cylinder design predominately used in Europe. Unlike traditional mortise and rim cylinders, the Euro profile uses a single piece of metal to connect both sides of the lock. A single cam component is placed between the two sides of the lock and is directly connected to both plugs. The Euro profile is convenient to install and replace, But, it the design of these locks do have serious vulnerabilities, and can easily be removed by attacking the door handles, and snapping the cylinder.